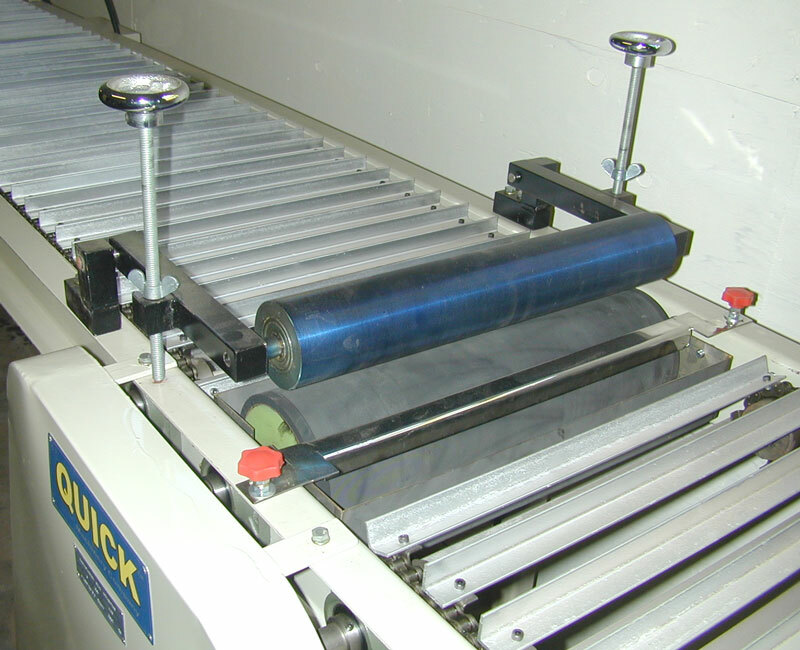 Quick Machinery Company offers a complete line of reasonably-priced Conveyorized Glue Applicators that compliment our Clamp Carrier line. Applicators are available with either 12", 16" or 20" wide glue rolls, with conveyors 10' long or longer (16' is standard, which works well with a standard 8.5' wide Clamp Carrier). Our Conveyorized Glue Applicators feature an elegantly simple and effective grooved rubber-covered roll/stainless steel doctor blade design. The two orange knobs are used to adjust the glue spread and to remove the doctor blade for easy cleaning. 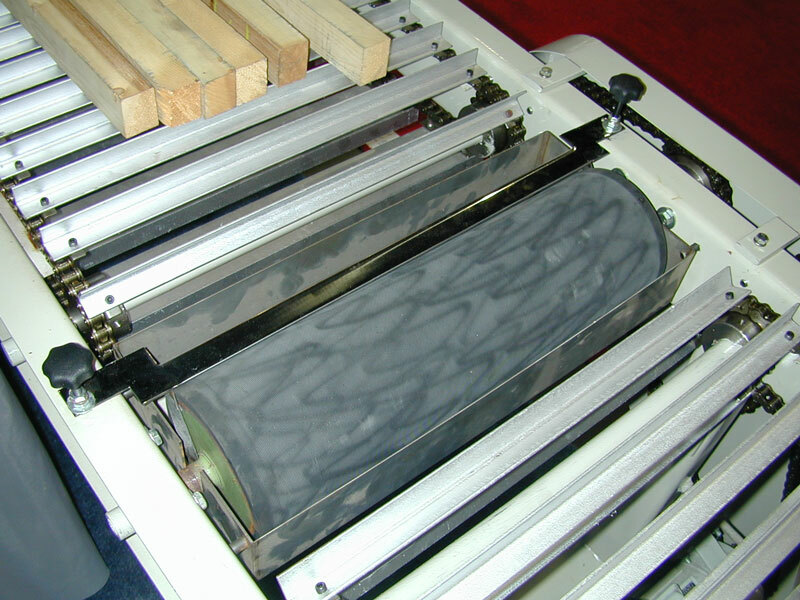 To view high-resolution photograph of the glue roll on a 20" wide Conveyorized Glue Applicator, please click on the image to the left. A stop wand at the outfeed end of the conveyor automatically stops the conveyor when the stock reaches the Clamp Carrier operator. To view high-resolution photograph of the stop wand on a 12" wide Conveyorized Glue Applicator, please click on the image to the left. 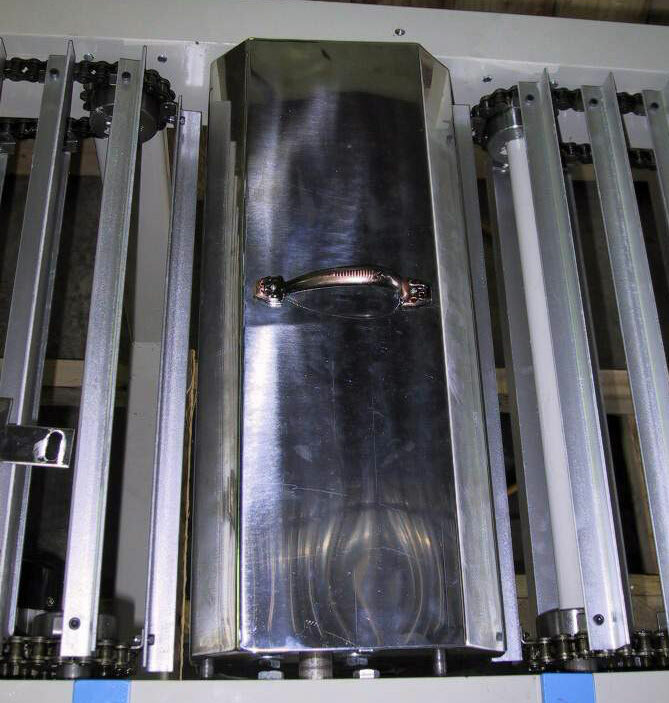 The Conveyorized Glue Applicator motor is 1/2 hp, either 220v or 440v, and either single-phase or 3-phase. Mounted on the motor shaft is an adjustable slip clutch, which helps ensure operator safety, and helps prevent crossbars from bending should material inadvertently get jammed in the conveyor. All components are made of high-quality materials. The chains, crossbars and bearings are all heavy-duty, for many years of trouble-free operation. With our included stainless steel glue pan cover, there's no need to remove the glue and clean out the glue pan at the end of each day. Instead, simply spray a mist of water on top of the glue, and place the cover over the pan. The glue will remain fresh, without skimming over, for 16 hours or more. The next time the Applicator is switched on, the thin layer of surface water will automatically mix with the glue. 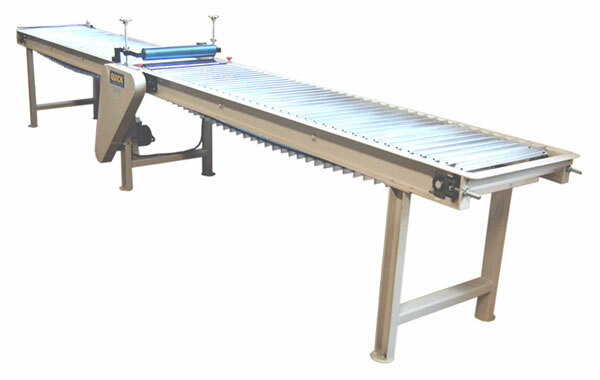 To view high-resolution photograph of the glue pan cover on a 20" wide Conveyorized Glue Applicator, please click on the image to the left. The stainless steel glue pan and doctor blade are easily removed without tools for quick weekly clean-up. An adjustable Holddown Roll is available as an option. This roll is used when face-gluing, such as when making handrail or laminated beams. 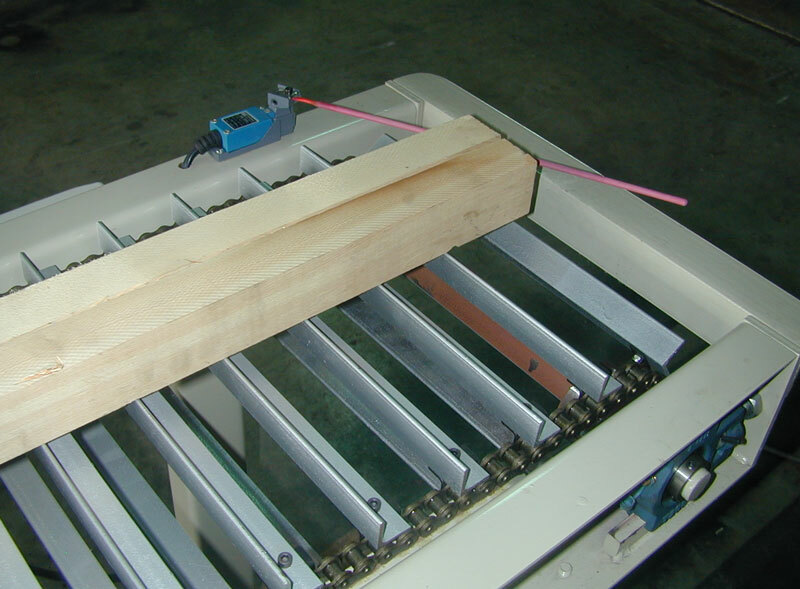 The roll holds the stock down flat onto the glue roll, helping to provide a consistent glue spread, even with warped or twisted boards. 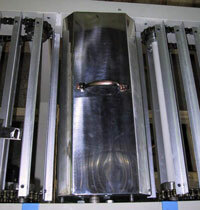 To view high-resolution photograph of a Holddown Roll mounted on a 20" wide Conveyorized Glue Applicator, please click on the image to the left. 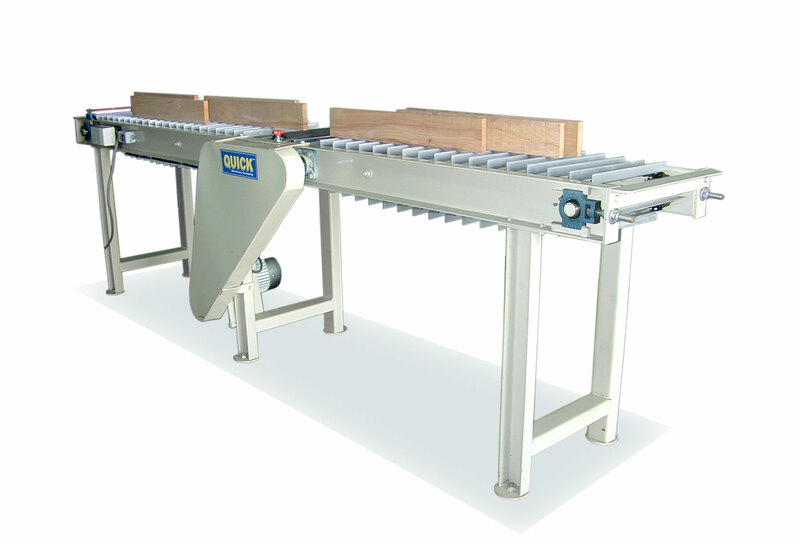 To view a movie of our Conveyorized Glue Applicator, please click on the image to the left. 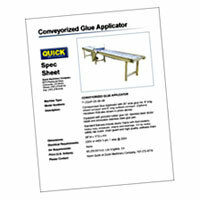 To download a PDF version of our Conveyorized Glue Applicator Spec Sheet (760 kb), which includes specifications, electrical and air requirements, dimensions and example pricing, please click on the image to the left. To download a PDF version of a QUICK Conveyorized Glue Applicator Installation/Operation manual, please visit our Manuals page by clicking on the image to the left.